"They have begun to attack civilians and destroy properties. Our role is to defend our society," he added. In the interview, Assad also denied having conducted alleged chemical attacks in the northwestern Idlib province last month – and accused the US of “creating the IS [Islamic State]” under their supervision. "Is it democratic to send weapons to terrorists and to support them? So I have the right to support the terrorists who attacked Charlie Hebdo for example?" he added. Assad also accused the US-led coalition of ineffectiveness. "If you compare the number of airstrikes carried out by the coalition composed of 60 states compared to those by our small state you will notice we sometimes strike 10 times more than the coalition in one day. Is that serious?” he said. "It took them four months to free what their media calls the town of Kobani on the Turkish border. How can you say this coalition is effective? They are not serious and that is why they are not helping anyone in the region," Assad added. Currently, Syrian and French intelligence are in touch, but there is no exchange of information, he also said. “You are more advanced than us, but if you want to compare us your number one ally, Saudi Arabia, of course, we are a democracy," he added. 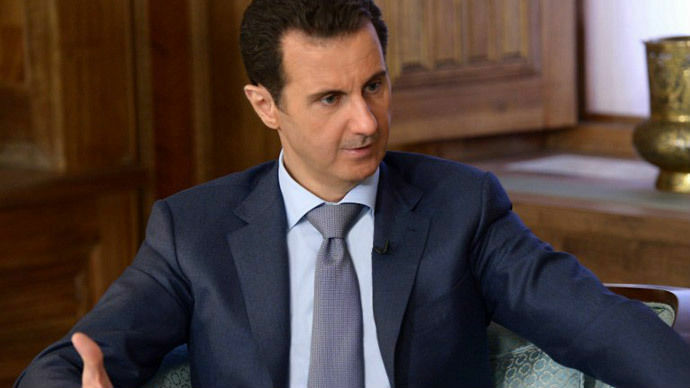 Last week, Assad gave another interview to the Swedish newspaper Expressen, stating that Europe “cannot be safe” while “the backyard of Europe, especially the Mediterranean and Northern Africa, is in chaos and full of terrorists. "Everything that happened in Europe, and I mean terrorist attacks, we warned from the very beginning of the crisis," he said. "We’ve had experience with those kinds of terrorists for 50 years now. They don’t listen, so what happened was warned of before, and what we saw in France, in Charlie Hebdo, the suicide attempts in Copenhagen, in London, in Spain 10 years ago, this is only the tip of the iceberg; terrorism is a huge mountain," he added. "We cannot leave the only Syrians who are preparing a democracy ... without weapons," Hollande told reporters in August 2014 while he was on a tour of the French island of La Reunion. France has frequently ruled out any negotiations with Assad’s government, closing their Damascus embassy in 2012. That goes in line with the ‘Assad must go’ refrain pushed for by Washington. About a week ago, four French lawmakers traveled to Damascus to hold unofficial talks with Assad, with their visit condemned by Hollande. Hollande also blasted a group of French MPs for a "moral failing" after they went to Syria to meet Assad in February. Over 215,000 people have been killed in Syria since the conflict began in March 2011, according to Syrian Observatory for Human Rights estimates last month.